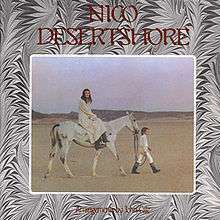 Desertshore is the third studio album by German musician Nico. It was released in December 1970, on the Reprise label. Desertshore was co-produced by John Cale and Joe Boyd. Like its predecessor The Marble Index, it is an avant-garde album with neoclassical elements. "Janitor of Lunacy" was composed as a tribute to her friend Brian Jones. The back and front covers feature stills from the film La cicatrice interieure by Philippe Garrel, which starred Nico, Garrel and her son Ari Boulogne. A few of the songs from the album were included on the soundtrack of the film. "All That Is My Own" was selected by Morrissey for inclusion on his Under the Influence compilation. "Le petit chevalier" was prominently sampled by Abu Lahab on his album Of Heliotaxis and Cosmic Knifing. In 2007, industrial music band Throbbing Gristle went into the studio to record a reinterpretation of Desertshore for a later release. The studio session was made open to the public and the entirety of the 3-day, 12-hour-long session was recorded, given a limited press, and released as The Desertshore Installation. The plan had been to edit these three days of recordings and craft the finished album from that material, but the group were not satisfied with the sessions and decided to re-record the album. Peter Christopherson continued working on it in Bangkok with Danny Hyde until his passing in November 2010. Hyde passed the work they had done to remaining Throbbing Gristle members Chris Carter and Cosey Fanni Tutti to complete, which they have accomplished with the help of several guest vocalists, including Marc Almond, Sasha Grey, Blixa Bargeld and Antony Hegarty. The album, called Desertshore/The Final Report, was released on November 26, 2012, under the name X-TG. The album was debuted live at AV Festival on March 17, 2012, performed by Carter and Tutti. It was accompanied by a screening of Philippe Garrel’s La cicatrice intérieure, "for which Desertshore was soundtrack and inspiration". Ari Boulogne – vocals on "Le petit chevalier"
↑ Deming, Mark. "Desertshore – Nico : Songs, Reviews, Credits, Awards : AllMusic". AllMusic. Retrieved 3 February 2013. ↑ Brackett, Nathan; Hoard, Christian David, eds. (2004). The New Rolling Stone Album Guide. Simon & Schuster. pp. 585–586. ISBN 978-0743201698. Retrieved December 3, 2014. ↑ Frowny, Guy. "Nico - Desertshore". Tiny Mix Tapes. Retrieved 27 August 2012. ↑ Unterberger, Richie (2009). White Light/White Heat: The Velvet Underground Day by Day. Jawbone Press. p. 296. ISBN 1906002223. Retrieved 7 April 2016. ↑ Hogan, Peter (2007). The Rough Guide to the Velvet Underground. London: Rough Guides. p. 72. ISBN 1843535882. ↑ Brown, Lee (2011). Meetings with Morrissey. London: Omnibus Press. ISBN 1847729878. ↑ "Wishful Thinking: In Remembrance of Peter Christopherson ‹ Events & Exhibitions ‹ 2012 ‹ Programme ‹ AV Festival". avfestival.co.uk. Retrieved 3 February 2013.